The Aegean Region is definitely a must-see when visiting Turkey. In the province of Balıkesir alone, there are heritage places, hotels and beaches that attract thousands of local tourists during summer. Meanwhile, the province of Aydin beats the latter with its port that welcomes cruise ships all year long, a coastal community of powdery beach, row of yachts, marina park and mall, etc. But hey, I am only speaking based on what I visited personally and haven't told you everything about other famous destinations yet, say for example the province İzmir. 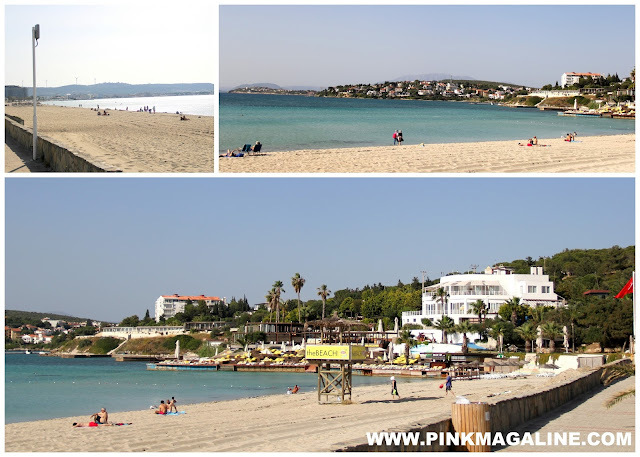 Honestly, of all three provinces I mentioned, it is my most favorite because it is where I can find one of my dream destinations, a place called Çeşme, also the subject of my post today. This is like the Turkish counterpart of the coastal town of Saint-Tropez in the French Riviera. I think the people living here are either really old residents or the very rich and famous. Here is the beautiful view of the marina and yacht club from Çeşme Castle. I will write a separate entry on the castle later on so watch out for it. It was a great place to visit. So hot that we also thought of swimming on the Ilica Beach. Long beach, fine sand and clear water. What do you want more? Just a few beach-goers tho. People normally crowd this place in June after school closing and summer officially starts. Meanwhile, let me take you to Alaçatı, a small town known for its narrow cobblestone streets, old houses, and boutique hotels. This place becomes alive at night when most clubs and bars stay open until the next morning. Like Greece? Wiki says this place is originally settled by the Greeks in the 17th century. That's why. We saw a lot of couples shooting their prenuptial photos that day. Look, couple #1 walking while couple #2 spotted behind the bougainvillea flowers. There were more couples but I was too shy to take their photos. Haha. We passed by a souvenir shop. And this house. I wish I live here. This place is so charming and posh. Till I see you again Çeşme! Not affected, sis. It is far from the border. Thank you. We are back in PH now tho.